Japanese jazz keyboard player and composer Keiko Matsui has performed in Baku. Spectacular concert took place at the Heydar Aliyev Palace on March 16, Day.Az reported. This is the fifth concert of a famous Japanese musician in Azerbaijan's capital city. 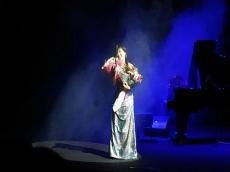 Keiko Matsui presented a new album "Echo" in Baku. Throughout the concert, the pianist performed works from both the new album and the already familiar hits. Each performance ended with a storm of applause from the public. At the conclusion of the evening, the public did not want to let the pianist off the stage. In response to the public's applause, the bright and sensual composition "Casablanca" was performed. Keiko told the audience that she loves to perform in Baku and is always looking forward to her visit to the Azerbaijan's capital. "Thank you for having spent this evening with me! I love Baku and its residents very much! I am sure that we will see each other again and again...," she said. After the concert, there was a large queue of music lovers who got a new autographed album of Keiko Matsui and made a memorable photo with her. Known for her crossover mix of smooth jazz, fusion, and new age music, Keiko Matsui is an internationally acclaimed pianist and composer. She started the band Cosmos, which recorded four albums. Keiko Matsui recorded her debut solo album, A Drop of Water (Passport, 1987), with her husband Kazu Matsui. Afterwards, Japanese musician signed with MCA Records and released the albums No Borders and Under Northern Lights. In 1992 she signed with White Cat. Sapphire (1995) reached No. 1 on the Billboard magazine Contemporary Jazz chart.